We’ve tried our hand against several items in Making It Rainfall. We’ve had Clown Car themed levels, ones based around Airships, conveyor belts and even red coins and keys. But somehow, we’ve been neglecting an item that was available almost since the beginning – the trusty P-Switch! That magical and frustrating item that turns coins into blocks, and vice versa, and makes doors materialize out of nothingness. Yes, the P-Switch is a chaotic item, best used for puzzles and frantic races to the finish. This batch of levels stays true to those themes, and all of these levels are creative and original. Only one exists that I was personally unable to beat, but that’s due to my own impatience more than any poor level design. We hope you enjoy this handful of P-Switch stages and join us next time for even crazier ideas! 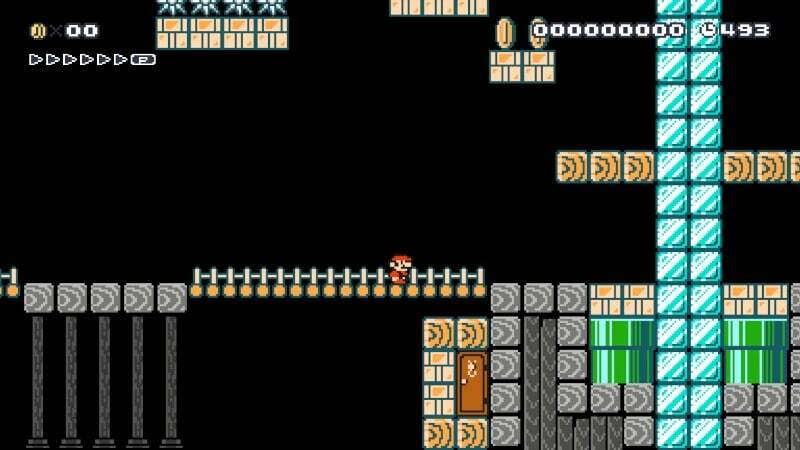 I wanted to try some of the new course elements out, so I decided to use red coins as the key (get it?!) to finishing the course. Rather than creating a huge labyrinth, I decided to hide the coins in a relatively compact area with a catch: nearly all the stable ground are coins which rely on P-Switches to make them into blocks. I added a few donut blocks in places, but the only way to progress is to utilize the P-Switches I peppered throughout the stage. Five red coins hidden throughout the stage gain you access to the exit. I wanted to try my hand at a few different ways to use P-Switches, so first off I decided to use them to reveal the Golden Sphinx. You’ll need to make your way to it by avoiding Dry Bones, Chain Chomps and Fire Bars, and once you get there and hit the P-Switch, you’ll need to race to collect all the Red Coins and get the Key before you lose access to your door! Once you get past this portion of the level, you’ll come upon Egyptian heiroglyphics with moving platforms, Kamek and other traps. Make your way through the Pyramid and the Scarab to make it to the exit pipe that leads to victory! A short, mean and fun level. Level 3 – Tetris Panic! For my second level, I wanted to try my hand at a stage where there are positive and negative aspects associated with hitting the P-Switch. This level is very short, composed entirely of Tetris Blocks made of ice. Platforms will rotate around the area carrying P-Switches, but before you get any bright ideas, don’t try using them to make an easy exit. The top of the stage is covered with flame jets and the bottom has hungry Piranha Plants ready to leap out and devour Mario. The question is, do you make your way across slippery Tetris Blocks and risk falling into the gullet of Piranha Plants, or hit the P-Switch to cover them with regular blocks, which put you at risk of getting roasted alive. One of my favorite levels I’ve made in a long time. I hope you enjoy it! This level gives you an infinitely respawning P-Switch that you must use to traverse ever farther into the level. The 2nd section is a little less P-Switching and a touch more difficult. 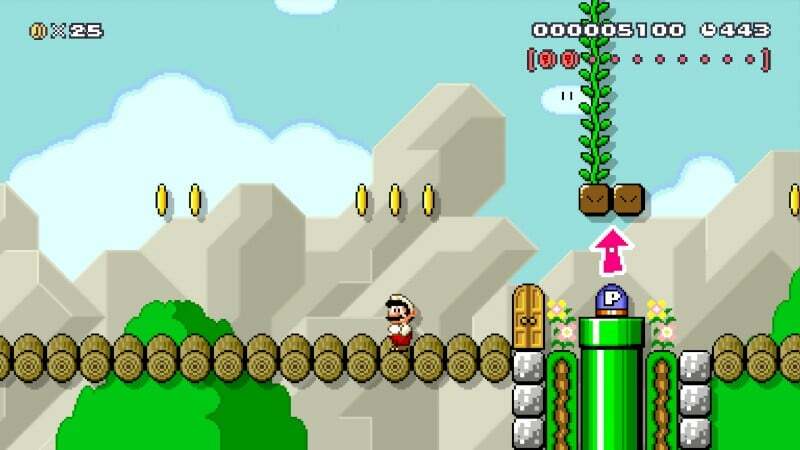 Can you find all 10 red coins to get the key you need to unlock the door to the goal? 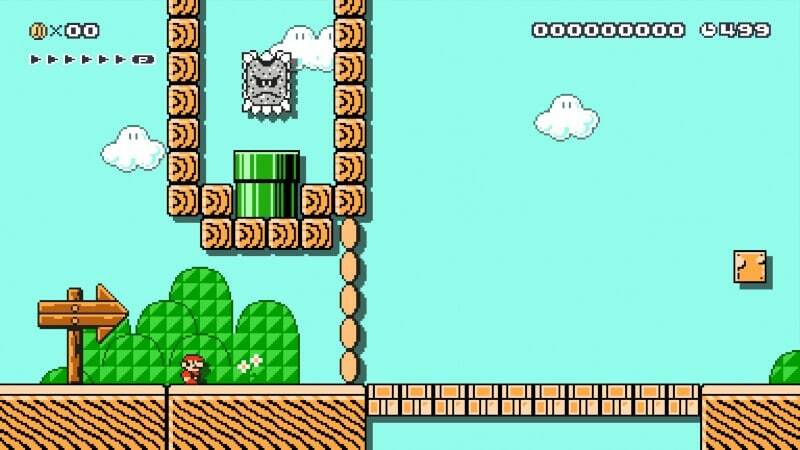 There are a handful of 1-Ups hiding around in the level as usual, and I also made sure that you can revisit any spot in the level at any time in case you should miss a red coin somewhere. I hope you guys enjoy this P-Switch powered red coin hunt! This level started out with our P-Switch theme, of course. After creating the first couple of segments, I started looking at maps of levels from Super Mario Bros. and Super Mario Bros. 3 to get some new ideas. So, as a result you may notice a few areas in this level might look a bit familiar. There are a handful of small bits and pieces lifted from levels in the classic games. 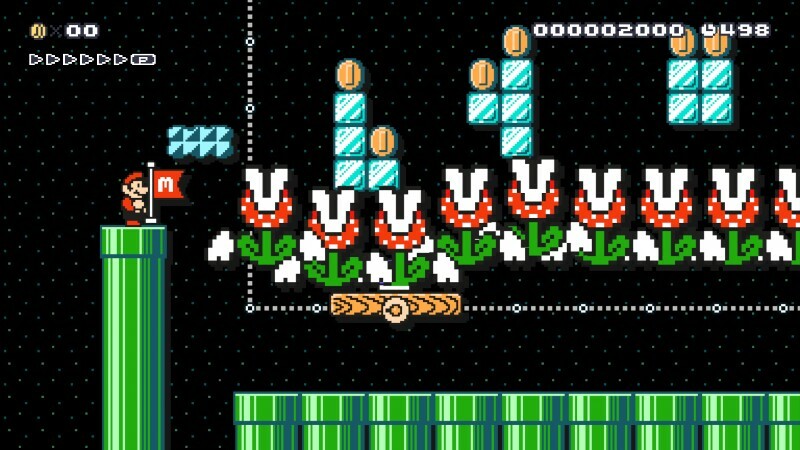 I also have three sub areas hidden in this level, and each of those will look familiar as they each take their main design from a sub area in those classic games. These areas are all slightly different than their original counterparts, though. 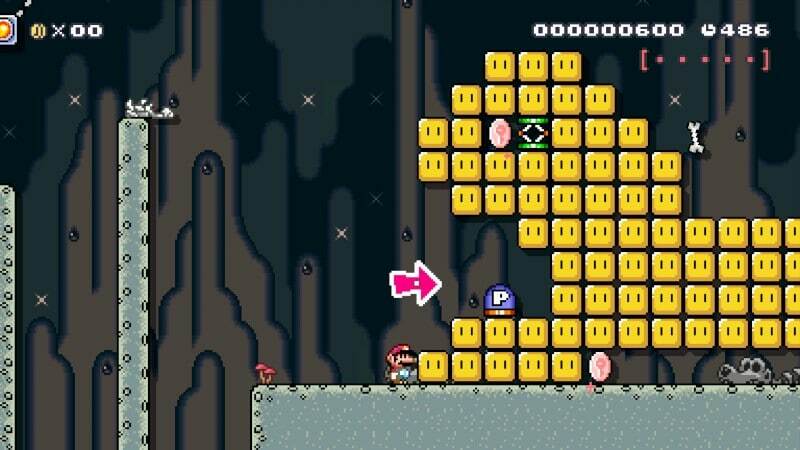 For example, the sub areas mostly all make some use of P-Switches to reveal a hidden 1-UP. These aren’t the only 1-UPs hiding in the stage, though! I hope you enjoy this level! Phil made an incredibly clever level where every section is a mirrored version of the one before it, and you’ll need to do some leaps of faith and pay attention to make your way to the P-Switches, which reveal hidden areas you’ll need to visit to make your way to the exit. 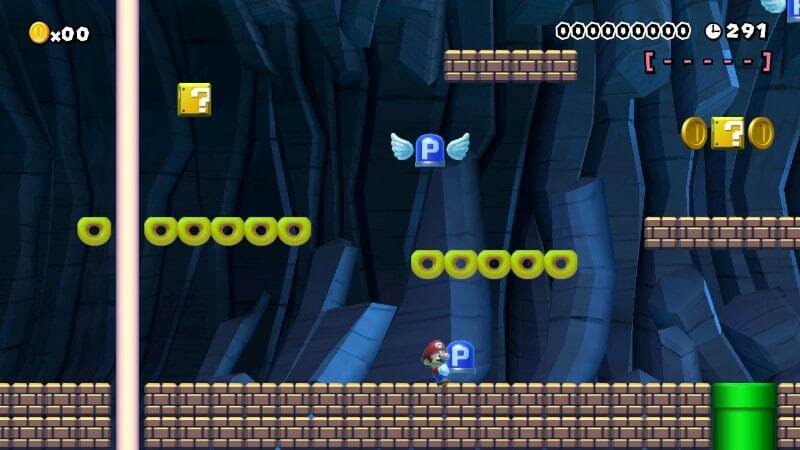 There are no enemies in this stage, just hazardous jumps, spikes and temporary bridges made out of coins. We hope you enjoyed our P-Switch levels this week! Let us know if you have any requests for our next batches of levels.